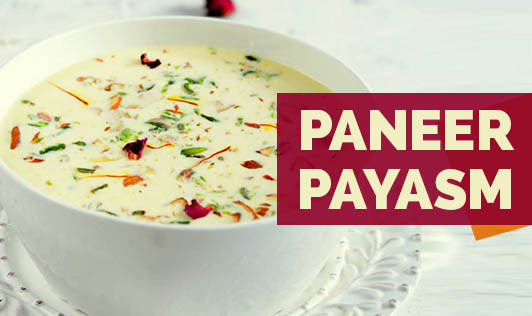 Paneer Payasam is a simple, delicious dessert that is simple, nutritious, and healthy; one that you're definitely going to fall in love with. 1. Add saffron to a teaspoon of milk and set aside. Add corn flour to another teaspoon of milk, mix well, and keep aside. 2. Crumble the paneer and keep aside. 3. Boil 2 cups of milk in a nonstick pan, add the cornflour paste, and boil for 10 to 15 minutes, while stirring continuously. 4. Add the sugar and, stir well until it is completely dissolved. Now add the saffron milk mixture and stir quickly. 5. Now add the crumbled paneer, mix well, and allow it to boil for another 5 to 10 minutes. 6. Add the elaichi powder and chopped nuts, and turn off the flame. 7. Allow it to cool at room temperature and refrigerate. 8. Serve chilled. You can also serve it warm. • Saffron is optional; you can skip it if you want. • Adjust sugar according to the sweetness you desire or use a sugar substitute to make it a low-calorie dish.